•Gibbs [1901, p. 340] named this vector the "vector semitangent of version." Cayley [I899J used the three quantities g,, g2. g3 in 1843 (before the introduction of vector notation), and he credits their discovery to Rodriguez. The Gibbs vector has not been widely used because it becomes infinite when the rotation angle is an odd multiple of 180 deg. Euler Angles. It is clear from the above discussion that three independent parameters are needed to specify the orientation of a rigid body in space. The only parameterization considered so far that has the minimum number of parameters is the Gibbs vector. We now turn to a class of parameterizations in terms of three rotation angles, commonly known as Euler angles. These are not as convenient for numerical computations as the Euler symmetric parameters, but their geometrical significance is more apparent (particularly for small rotations) and they are often used for computer input/output. They are also useful for analysis, especially for finding closed-form solutions to the equations of motion in simple cases. Euler angles are also commonly employed for three-axis stabilized spacecraft for which small angle approximations can be used. To define the Euler angles precisely, consider four orthogonal triads of unit vectors, which we shall denote by x,y,i x",y",i"
The initial triad x,y,z is parallel to the reference 1,2,3 axes. The triad x',y',z' differs from x,y,z by a rotation about the / axis (1 = 1, 2, or 3 depending on the particular transformation) through an angle <f>* Thus, the orientation of the x'.y'.z' triad relative to the triad is given by A,(<p) for /= 1, 2, or 3, one of the simple direction cosine matrices given by Eq. (12-6). Similarly, the x",y",z" triad orientation relative to the x'.^.z' triad is a rotation about a coordinate axis in the x',y,z' system by an angle 6, specified by Aj(fi), j=* 1, 2, or 3,j + i. Finally, the orientation of u,v, w relative to x",y",z" is a third rotation, by an angle \f>, with the direction cosine matrix Ak(il>), k = 1, 2, or 3, k # j. The final u,v,w triad is the body-fixed triad considered previously, so the overall sequence of three rotations specifies the orientation of the body relative to the reference coordinate axes. * Although Euler angles are rotation angles, we follow the usual convention of denoting them by lowercase Greek letters. A specific example of Euler angle rotations is shown in Fig. 12-3. Here, the first rotation is through an angle <f> about the z axis, so that the z and z' axes coincide. The second rotation is by 0 about the x' axis, which thus is identical with x". The third rotation is by \p about the z" (or w) axis. This sequence of rotations is called a 3-1-3 sequence, because the rotations are about the 3, 1, and 3 axes, in that order. 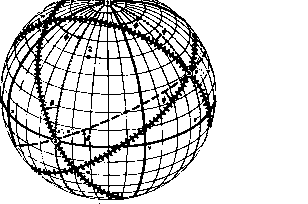 The labeled points in the figure are the locations of the ends of the unit vectors on the unit sphere. The circles containing the numbers 1, 2, and 3 are the first, second, and third rotation axes, respectively. 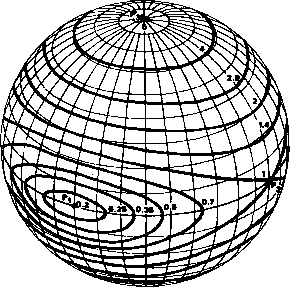 The solid lines are the great circles containing the unit vectors of the reference coordinate system, x,y,z. The cross-hatched lines are the great circles containing the unit vectors of the body coordinate system, u,v,w. 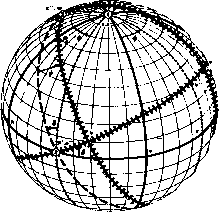 The dotted and dashed lines are the great circles defined by intermediate coordinate systems. The Euler axis corresponding to Am(<t>,9,ip) can be found from Eq. (12-10); it is denoted by ê in Fig. 12-3. Note that Eq. (12-21a) leaves a twofold ambiguity in 8, corresponding to sin0 being positive or negative. Once this ambiguity is resolved, <j> and $ are determined uniquely (modulo 360 deg) by the signs and magnitudes of Ai3, A23, A3l, and A32, with the exception that when 9 is a multiple of 180 deg, only the sum or difference of $ and \f/ is determined, depending on whether 9 is an even or an odd multiple of 180 deg. The origin of this ambiguity is apparent in Fig. 12-3. The usual resolution of this ambiguity is to choose sinfl > 0, or 0 < 9 < 180 deg. As in the 3-1-3 case, the angles are determined up to a twofold ambiguity except at certain values of the intermediate angle 9. In this case, the singular values of 9 are odd multiples of 90 deg; The usual resolution of the ambiguity is to choose — 90 deg<#<90 deg, which gives cos0 > 0.
where the angles are measured in radians.